I'm sure you all just want me to get to the name of the winner, but first things first. I want you all to know that I tried to be as fair as possible. 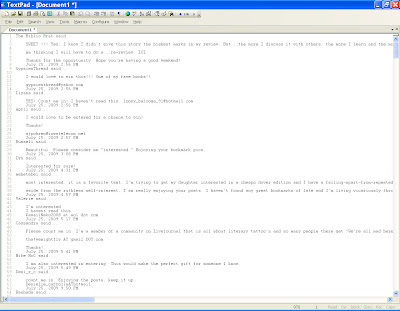 I copied all 222 comments from the Giveaway post and pasted them into TextPad, which provides me with line numbers. There were 969 total lines. 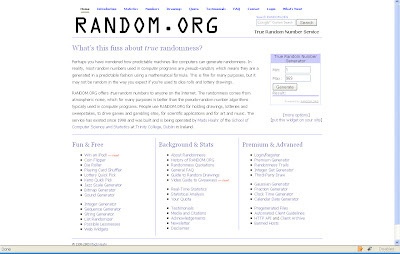 Next, I went over to Random.org for some number generation. 969 was the max. Finally, the moment of truth. Thank you to all who entered. Some of you already know that I have giveaways on a fairly regular basis, especially though Twitter - so keep an eye out, and good luck next time. ever? that's a little sad. hopefully this will change your luck. So then don't people who write longer comments have a higher chance of winning? WTG and congrats on your win pH. Great way to start the week out. Yes, I was thinking the same thing... 222 comments and 969 lines. If you look at the data - at a minumum there are 4 lines per comment: "x said...", newline, actual comment, date. This means that there should have been 888 lines if each of the comments was kept to a single line of text. There is about 10% more - or approximately 22 - comment lines than there should be. Sorry, I don't know where my head was at. 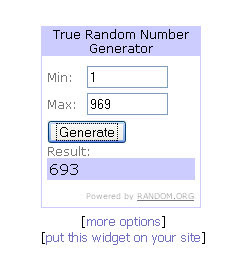 969-888 does not equal 22, it equals 81.